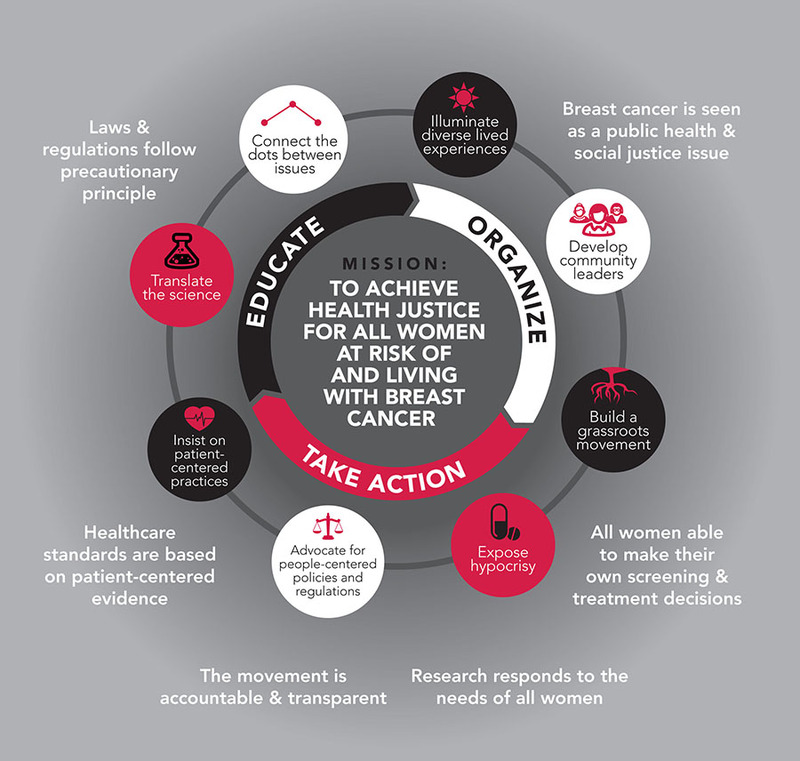 Breast cancer is a social justice issue and a public health crisis. Individual action alone, whether in terms of lifestyle or behavioral choices, is not sufficient to tackle the root causes of this breast cancer epidemic. We focus on systemic interventions that will address the root causes of the disease and produce broad public health benefits. These benefits will ensure that fewer women develop breast cancer and die from breast cancer and so that no community bears a disproportionate burden of diagnosis or death from this disease. As the watchdog of the breast cancer movement, we educate, organize and take action for systemic change. translating the science around breast cancer into everyday language through educational materials, webinars, and one-on-one consultations. building a grassroots movement through expanding and engaging our activist membership base, and deepening our partnerships. exposing hypocrisy and lack of accountability in the breast cancer industry through our communications and campaigns. All women deserve access to evidence-based, patient-centered information so they can fully engage in their healthcare decisions. Breast cancer research, treatment, and screening must be patient-centered and responsive to the needs of women at risk of and living with breast cancer, and should not reflect corporate or industry bias that puts profits over patients. Our work on diagnosis and treatment examines the data from a patient perspective and includes analyses of breast cancer screening; healthcare access; drug and device approval; and more effective, less costly, and less toxic treatments. Individual solutions like “shopping wisely” and “choosing healthy” are insufficient to stem the driving environmental causes of the breast cancer epidemic. Only large-scale systemic change can address the root causes of breast cancer. We work to address these root causes by eliminating the involuntary exposures to hazardous and toxic chemicals present in our daily lives that put people at increased risk of breast cancer. Our work is guided by the precautionary approach to public health and true primary prevention of breast cancer. Breast cancer has ballooned into a multibillion-dollar industry, even as it remains a public health crisis, and the pink ribbon is now one of the most widely recognized symbols and marketing tools. The pink ribbon provides many people with a sense of community and has turned breast cancer into a topic of shared conversation rather that a shameful secret. Yet the significant lack of accountability, the absence of transparency, and the widespread hypocrisy in the pink ribbon marketing culture exploits a disease that devastates communities, misrepresents who is affected by breast cancer, and excludes and marginalizes women’s diverse lived experiences of the disease. Our work to end this breast cancer epidemic cuts through the pink noise to tell the hard truths about this disease and challenge “pinkwashing” hypocrisy and pink ribbon culture, which have become the status quo of the breast cancer industry. We address the impact that breast cancer has on women’s lives and communities, and work to bring about the systemic changes that will end this epidemic. The breast cancer movement and general public will view and address the breast cancer epidemic as a public health crisis and a social justice issue. Women will have the information, resources, and support they need to make decisions about their breast cancer screening and treatment based on their values and priorities. Healthcare standards for breast cancer will follow the evidence and put public health before corporate profits. Researchers, nonprofit organizations, and institutions will pursue a research agenda that is responsive to the needs of all women at risk of and living with the disease, including historically underserved and marginalized communities. 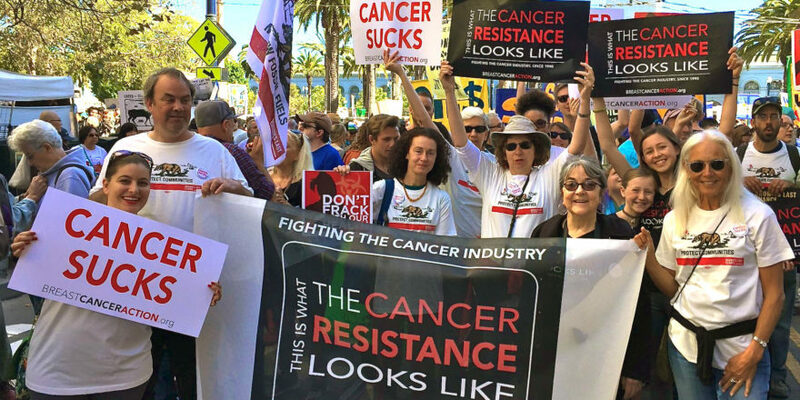 Lawmakers and regulators will enact environmental policies that follow a precautionary approach to public health so that all communities are safe from toxic exposures that increase the risk of breast cancer. The breast cancer movement will be held accountable and will be transparent in its marketing and messaging to women living with and at risk of the disease.